Darn, can't add the "s"
(plug coming up) While going through this cookbook for my cooking game on another site, I came across this recipe that DH and I have made twice now. Both times we gave it a "Very Good" rating and will surely make many more times. Apply a heavy coat of black pepper to both sides of the Spam slices. Press it down so that it stays on. Grill the slices over the hot fire for just a few minutes on each side. When the slices are golden brown and crusty looking they are done. Serve with the mustard sauce. Combine all of the ingredients in a saucepan, stirring to blend, and simmer over low heat for thirty minutes. Let stand at room temperature for 1 hour before using. Yield: 1 3/4 cups. Last edited by Joan; 01-25-2019 at 02:13 PM. Have you tried the Bacon Spam? Hi Phil, (I snagged your S lol) Yes, we have had both Bacon Spam and Turkey Spam. Sorry to say, as much as I love bacon, I could hardly taste it. The turkey Spam was just a little bit better. What did you think of it? I think I've found my Superbowl pregame snack. Thanks Joan!!! 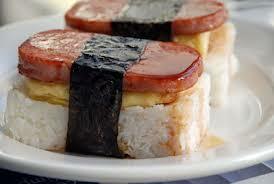 Spam was a big item for the troops in WW II. My Dad was in a German POW camp. When they got Red Cross Parcels, they loved getting the one pound can of Spam that was included, if the German's had not already pilfered them. Spam, candy bars, and cigarettes became barter inside the camp and to exchange with German guards for other useful items, like radios or fresh eggs. 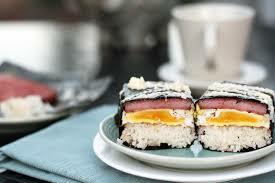 Dad always had a soft spot in his heart for Spam We always had a can around the house , and he loved it fried. Your welcome Chuck, hope your team wins.!!!!! Thank you Lynn for sharing that beautiful/and sad story. Hi Chuck, did your team win? Did you serve the Spam? If so, what did they think of it? Hi Joan. I don't have a team, I barely even like football anymore, we just watch post season football. We always have Spam in our camp kitchen. not only is it tasty to eat, it makes great bait for yellow jackets. Which we deal with all the time here when camping. Screw a can to a board open the lid and place the board over a bucket of water. Now for breakfast island style serve Musabi! Can be found at every gas station deli!